Though I am normally one to unbox Papergang boxes on my youtube channel, this months has arrived to late to fit in my schedule. I have though and do sometimes share certain things both on here and my youtube channel. It completely depends on the week, time and month. Even down to what I fancy talking or writing about. As you all know I am a huge believer in self-care. This box is in collaboration with Gemma Correll and the box is all about self-care. Oh Hello. I am very excited to share this with you, even from just looking at the cover its so bright and cheerful. With positive quote bubbles across. Quotes such as “remember to breathe” “didn’t bottle it up” and “did my best.” Its pastel colours yet brightened up a bit I guess to be bolder and what I would call happy colours. So lets open this box. Each box I have had so far has been rectangular like this with the sleeve and cardboard box, apart from one, that was cylinder shape. 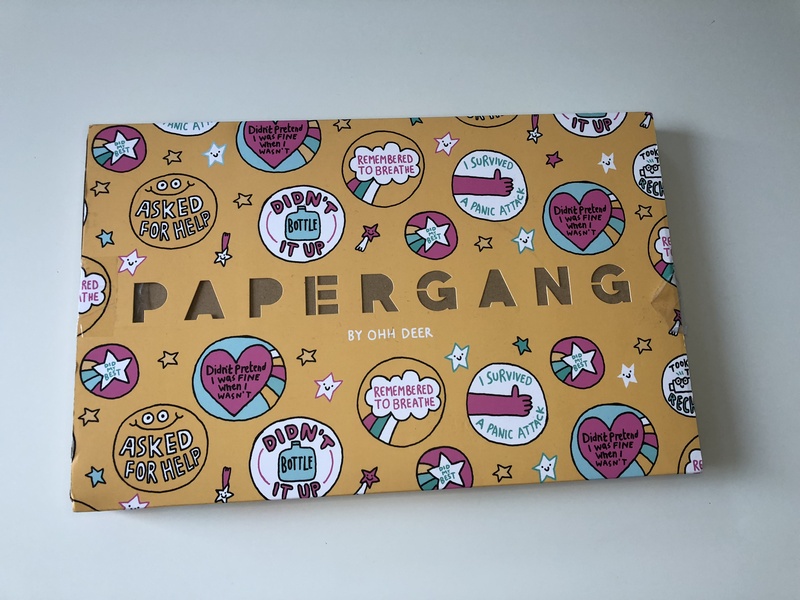 When I open this box the products are wrapped in baby pink tissue paper and the lid shows you just how papergang works. The first thing I have picked out is the Ohh Deer Papergang leaflet. This shares with you about what is in the box, what costs what and a bit about the collaborator. So in this they have interviewed Gemma and asked her questions about her job etc. It also has 3 cut outs for self-care awards. The quote in the front makes me laugh. 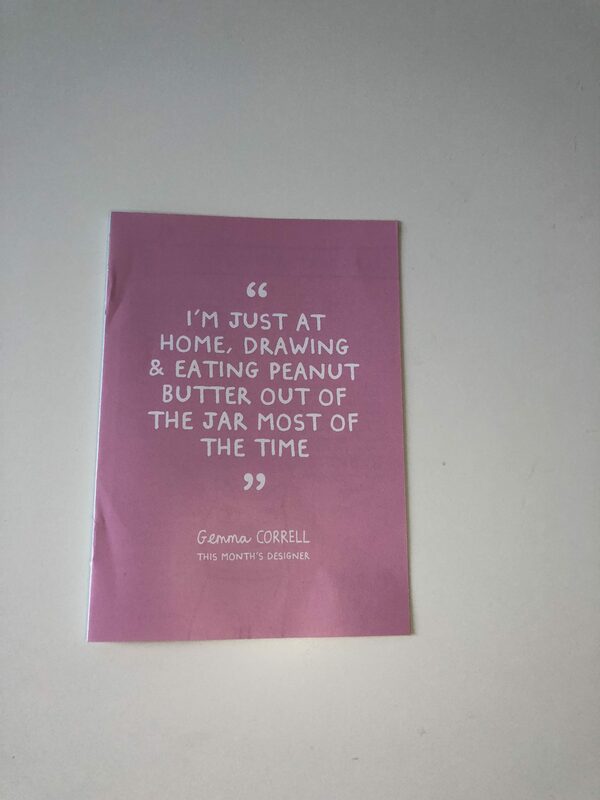 “ I’m just at home, drawing & eating peanut butter out of the jar most of the time.” – Gemma Correll. Anyone who has followed me for a while know I have the craving for something sweet most days and can easily dig in to a jar of lotus biscoff spread. The quote from Gemma is me. 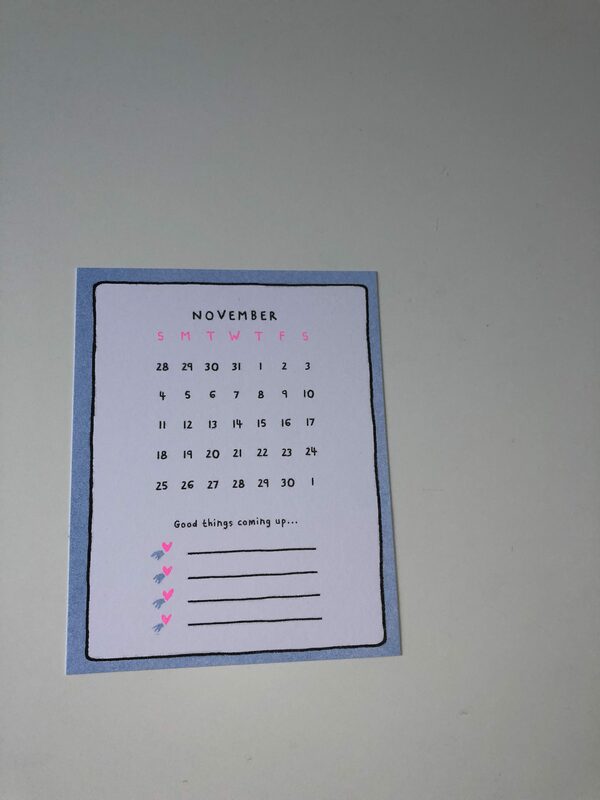 The next I have pulled out is November’s calendar A5 postcard. I love these, you get one each month and I always feature these as my hello (month) post on Instagram. This one is super cute, baby blue border with white background. The added flourescent pink brings the card to life. That and the black writing. I wonder what good things I have planned for November I can write in the bottom section. These calendar cards are only available as part of the subscription box. 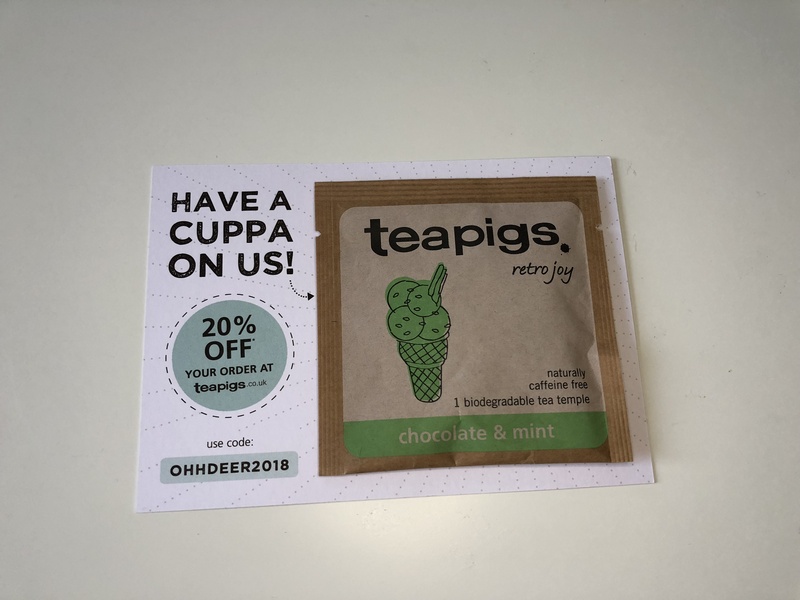 Now I have a teapig teabag in chocolate and mint. I also have a discount code for 20% off. I really want to get into drinking tea, hot drinks even but I just can’t. I am 28 and don’t like any hot drinks. How can I be a grown up and not like or drink hot drinks? I think I will be delivering this to my best friend to have next time I visit her. These stickers are all for self-care and I think these will be great for bullet journalling especially. If you need that little extra colour on the page or that little extra “actually you’ve had a good week’ then these will work. I love them. These stickers are £3.95. 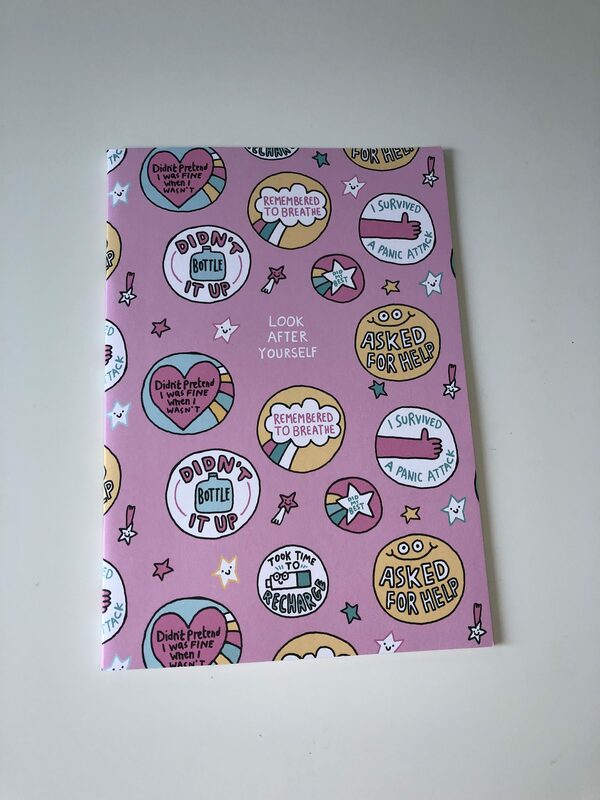 Then I have this cute to do list pad. I like to use a planner, write lists and have to do lists because it helps me to stay organised and motivated, keep my flat the way I like it and do all the things I need to do that day. The cute cat laying on the top of the list licking his paw. Thats self-care. Its a symbol of self-care. I also love the bottom bullet point is already filled in with Snooze. Yes please sleep is so important. 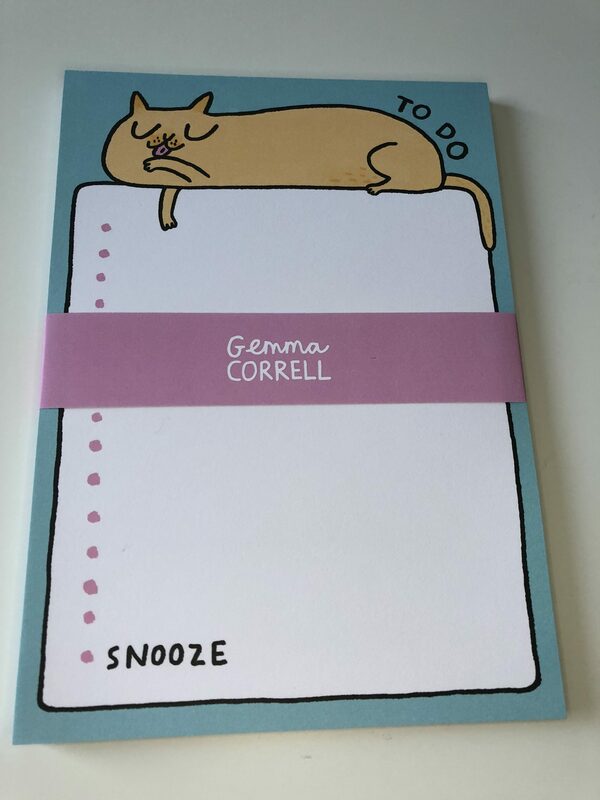 This A5 notepad is £5.95. I have this huge poster next, which is academic calendar. I actually can see myself using this to plan posts and schedule things. On the back of the calendar its a huge yellow blob that smiling. 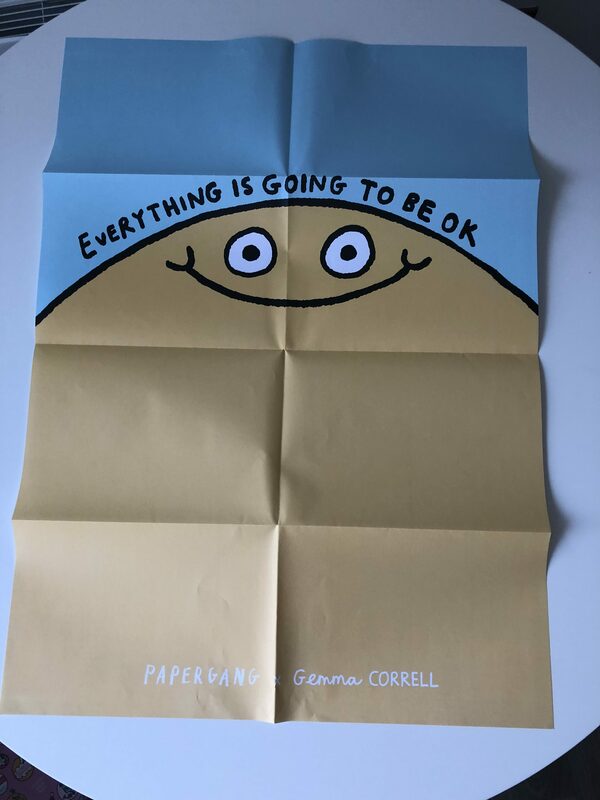 It says “ Everything is going to be ok.” Its totally true things will be ok. 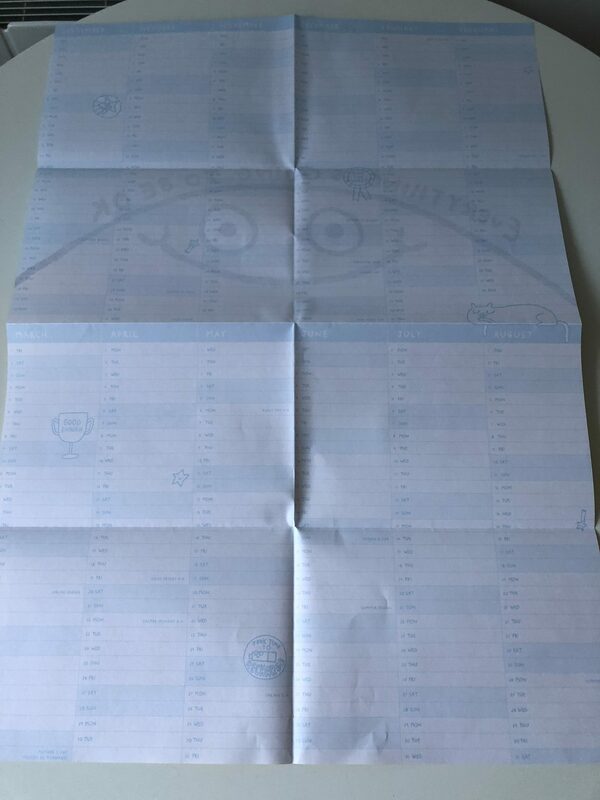 I will say the pastel baby blue of the writing on the calendar is a little bit too light so hard to see. This is £4.95. Next up is one of my favourites. I love notebooks and have used all of the ones I have received so far. This is a similar print to the sleeve of the box. I love the colours. They just make me smile and cheerful. Inside the pages are lined on both sides. On the right hand side of the double page is a little cloud and rainbow in the baby blue again with room for the date. Super cute. I can’t wait to start using this. This notebook is £4.95. The final product I have is this poster. I must admit its a bit of card but its the most expensive thing in this box at £8.95. But anyway its that simple reminder to breathe, things will be ok whatever and breathing really helps you calm. Take that time to meditate, breathe in for 5 and out for 5 and calm down before you need to return to what you were doing. I don’t think I will use this properly but I can see this working if you need that reminder to meditate or practice breathing. 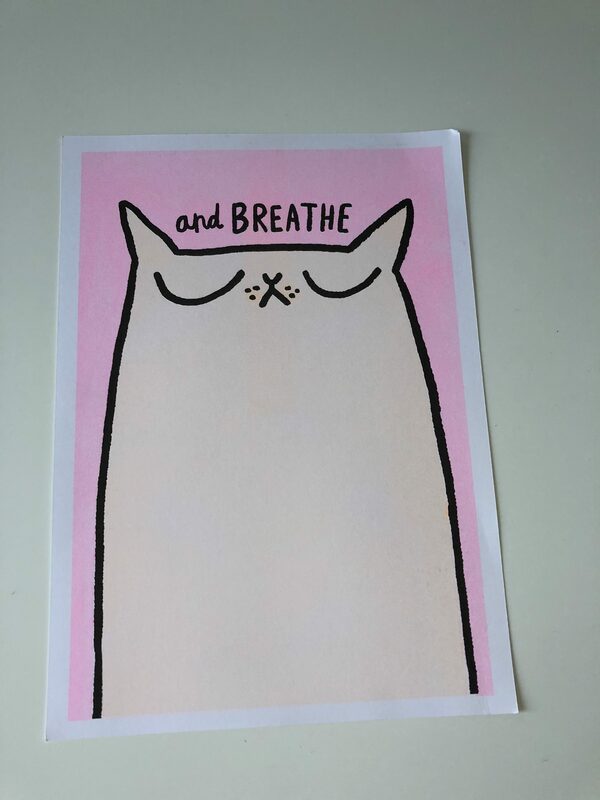 The cat print is cute with its eyes shut and the “and breathe” in between its ears. I love the pastel pink background. 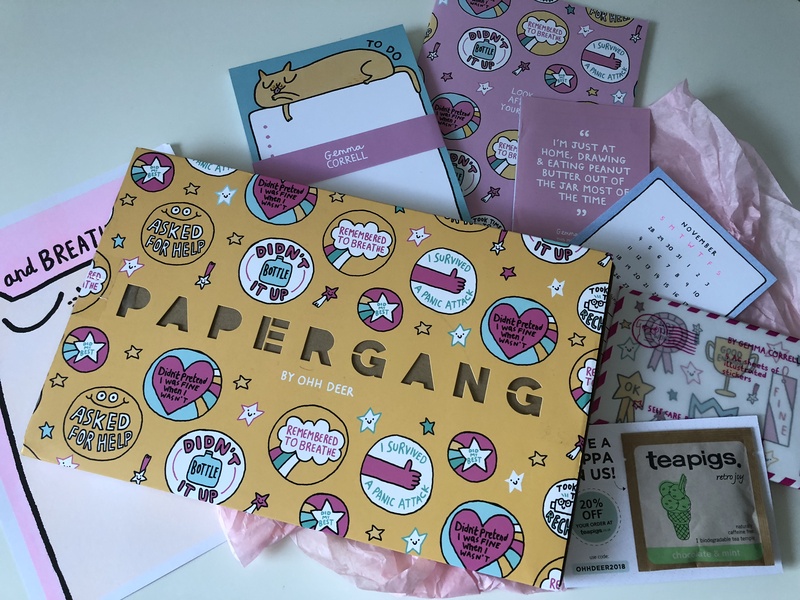 So this is my September Self-Care Stationary Papergang box. What is your favourite product in the box? Do you use self-care or carry a bullet journal? I’m a big fan of stationery and I didn’t realise that a stationery subscription service exists! I must check it out! I’m obsessed with stationary! I want it all! Need to check this out- thanks for sharing! I’ve never used a bullet journal! My kids always end up taking it and make it their own! I love the artwork on the box – it’s really sweet and whimsical! Looks like lots of cool goodies! I’ll take the chocolate and mint tea please! 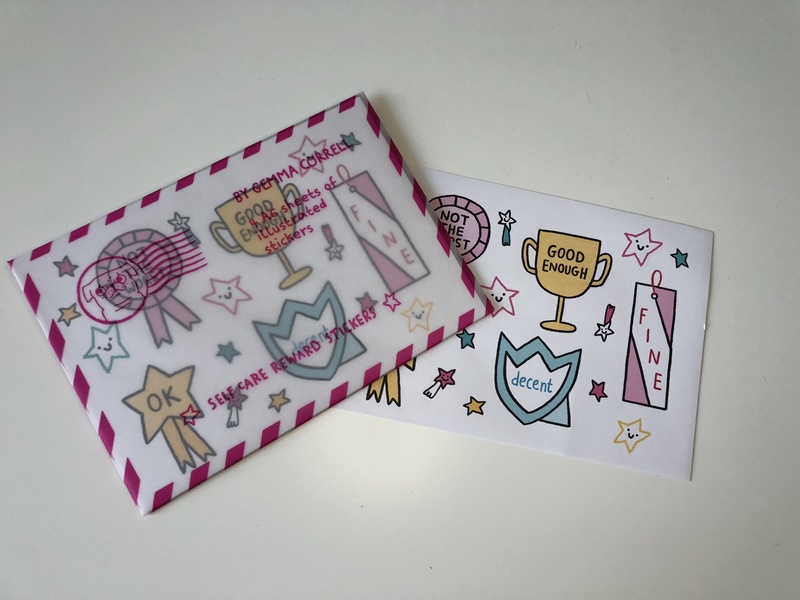 I love the idea of self care reward stickers! How was the peppermint chocolate tea? thank you! I don’t drink hot drinks but it smells good. Wait till I see my bestie to give it to her.